Here you’ll find all the information you need for a legal marriage in New York State, certified by the New York City’s City Clerk office. The fee for a Marriage License is $35 only by credit card or money order payable to the City Clerk. A New York State Marriage License is valid for 60 days (180 days for active military personnel). 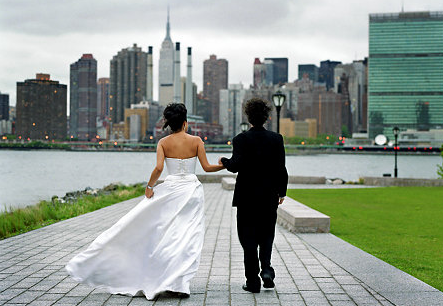 A marriage license issued in New York can be used anywhere within New York State only. You can begin the application process to receive a marriage license online. This will speed up the process when you complete the application form together and at the same time at the City Clerk Office. Your marriage license will be processed and after you’ve checked it for mistakes, you must wait a full 24 hours before your marriage ceremony can be performed. The marriage license application requires the following information from each of you: your name; current address; city, state, ZIP code and country; country of birth; date of birth; name and country of birth of your parents; Social Security number and marital history. If you were married before, you must list all prior marriages. You must include your previous spouse's full name; the date the divorce decree was granted; and the city, state, and country where the divorce was issued. You may be asked to produce the final divorce decree. If your spouse is deceased, you must provide that spouse's full name and date of death. When you sign the application, you are making a sworn statement that there are no legal impediments to the marriage. You and your prospective spouse must provide one form of identification in order to apply for a marriage license, either a passport, driving license, court document or baptism certificate. You must state your choice of married surname on your application. The surname change takes legal effect at the conclusion of the marriage ceremony. You may have a civil marriage ceremony in the City Clerk's Office. Weddings are held during regular business hours, though no reservations or appointments are accepted. The couple arrive at the office together, with the same proof of identity already shown for the marriage license. The couple must also have a witness, aged 18 years of age or older, with their own proof of identify. You can arrange a civil or religious marriage ceremony in any location you wish within the State of New York, the only rule is that the ceremony must be conducted by a marriage officiant who is eligible to perform marriage ceremonies under New York state law. At the conclusion of the marriage ceremony, the officiant, the couple, and the witness must sign the marriage license which the officiant must return to the civic office. A certificate of marriage registration is the official documentation of your wedding. If you marry in the City Clerk's office, you will receive your certificate of marriage registration at the conclusion of the ceremony, otherwise it’s twenty days for the date your officiant has submitted the license. An extended certificate can be issued for foreigners to take back to their home country.